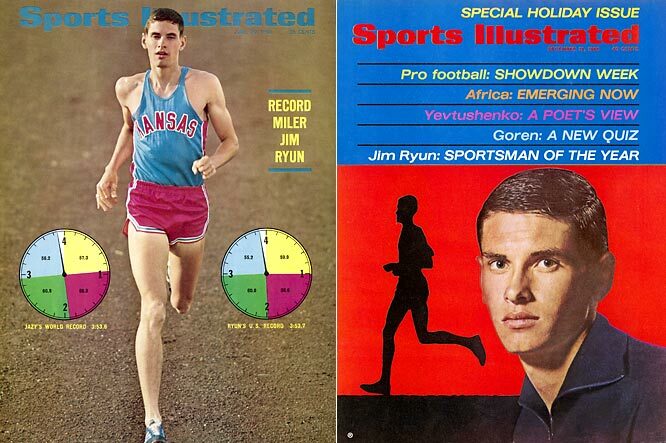 Jim Ryun’s career in the late 1960s, especially at Kansas, became legend. Fifty years to the day, Jim Ryun will be in San Diego to savor his place in history as the first high schooler to run a mile under 4 minutes. He’s also inviting some friends. On June 5, Balboa Stadium will host the Jim Ryun Festival of Miles — with evening races for age-group youngsters, preps, elites and masters athletes. “I want to share my story,” Ryun said in a recent phone interview from his home in Washington, D.C. “A simple prayer by a guy who was cut from every team he was on” before discovering his mile talents. Ryun is teaming with San Diego Track Club coach Paul Greer (himself a sub-4 miler), race coordinator Tracy Sundlun and his Competitor Group and others for what he calls a “celebration of running.” A website and Facebook page were being planned to promote the event, which hopes to see someone run a mile under 4 minutes. Admission is free, he said, and efforts are under way to reunite all prep sub-4 milers (except Chula Vista’s Tim Danielson, on trial in a murder case). Possible guests are Marty Liquori, Luke Verzbicas and Alan Webb — the current high school record holder. The weeklong event kick offs Friday, May 30, with the 17th annual Suja Rock ‘n’ Roll Marathon Expo at the San Diego Convention Center, where Ryun will be presenting training tips and interacting with runners. Ryun also will serve as grand marshal for the marathon Sunday, June 1. Events will take place throughout the following week, culminating with the Festival of Miles from 5:30 to 9 p.m. Thursday, June 5, at Balboa Stadium. Elite fields in open and masters age groups are being assembled. Event sponsors include Enterprise Rent-A-Car, Reliant Beverage Company, San Diego County Chik-fil-A stores, The Westin, Vision Biotechnology Consulting, Competitor Group Inc. and the San Diego-Imperial association of USA Track & Field. It was June 5, 1964, when Ryun — a gangly 6-foot-2, 145-pound junior from Wichita — took eighth at the Compton Invitational mile at Compton Junior College. And stunned the world. Ryun would go on to smash the mile world record (twice) and set records at 880 yards and 1500 meters as well. He made the 1964 Olympic team his junior year — the first of three Games appearances. He won a silver medal (Mexico City 1500) and retired from competition in 1976. Ryun’s daughter, Catharine, lives in San Diego and works for the group that puts on the Rock ‘N’ Roll Marathon — so he’s no stranger to these parts. But before last year, Ryun hadn’t returned to Balboa Stadium on the campus of San Diego High School since 1965, when he set a high school record of 3:55.3 that lasted until Webb ran 3:53.43 in 2001. Balboa Stadium was his choice for the Festival of Miles, he said, because “there was support out here” and “All of my [world] records were set in California” except for the half-mile in Terre Haute, Indiana. Ryun recalls how Bob Timmons, his first coach at Wichita East, planted the notion of a sub-4 schoolboy mile while on a bus trip home from just his fourth mile race. Just six weeks after his 17th birthday, Ryun lined up for a Compton race televised by ABC’s “Wide World of Sports” and featuring America’s top milers. Ryun wasn’t merely strong. He had remarkable footspeed for a middle-distance runner. He didn’t know how to use blocks, but got some tips from teammates. “I ended up running 10.3 for 100 yards,” he said. “It was pretty good speed.” As a Jayhawk, he also notched 220- and 440-yard legs in relays of 21.5 and 46.9, respectively. Besides serving in Congress five terms, ending in 2007, Ryun has run a series of summer running camps for 43 years. See ryunrunning.com. Just days shy of his 67th birthday, Ryun is still 6-2, but ranges between 195 and 200 pounds, he says. He still runs — but not four laps for time.